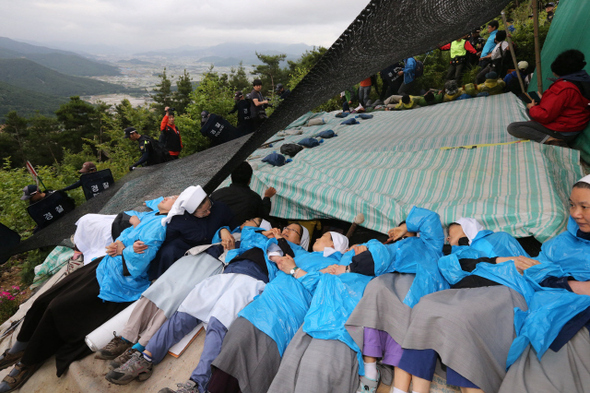 Police on Wednesday (june 11) forcibly removed sit-in camps where some residents of Miryang, South Gyeongsang Province, have been protesting for years against a power transmission tower project. 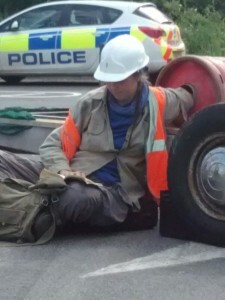 The action prompted a violent clash with the protesters. Witnesses said 19 people sustained injuries during the clash. Fourteen were taken to a local hospital. For the past few years, hundreds of villagers have set up makeshift houses on the tops of mountains in Milyang to stop the construction of high-voltage transmission towers by the state-run Korea Electric Power Corp., or KEPCO. PeaceWorks – Kansas City held 4 actions over the May 31-June 1 weekend. On Saturday morning, May 31, we held two rallies in Leavenworth, Kansas. At one rally, we sought pardon for Chelsea (formerly Bradley) Manning at Fort Leavenworth, Kansas. She’s begun serving 35 years there for revealing U.S. war crimes in Iraq and Afghanistan. 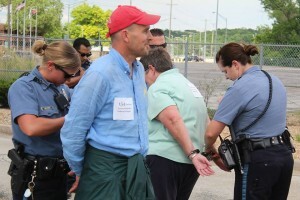 The second rally, two miles up the road at the Federal Penitentiary, called for pardon for Greg Boertje-Obed, now serving about 5 years in the pen for the Y-12 Transform Now Plowshares action against nuclear weapons at the uranium processing site in Oak Ridge, Tennessee. Saturday afternoon we went to the old Kansas City Plant for making parts for nuclear weapons, to demand comprehensive cleanup of about 900 known toxins there. The contaminants have poisoned workers at the Kansas City Plant and other federal agencies at the Bannister Federal Complex.